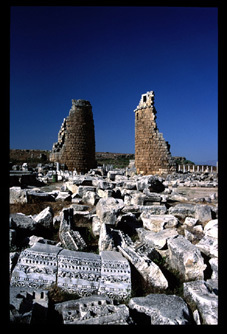 Some sources say that the ancient city of Perge was founded by three people returning from the Trojan war.However the Hittite tablet found in Boðazköy mentions the name of the city as Parha,and judging from the name of a goddess on an ancient coin found there,the city has a very old history .It is known that the lands where the Akhas settled around 2000 B.C.,and where the Hellenistic people from Epir and from the Western Anatolian shores settled in 7th Century BC were later ruled by the Lydians in the 6th Century BC and also by the Persians .These lands were conquered by Alexander the Great in 333 BC and after his death were ruled by the Seleucids , the Pergamum Kingdom,and by the Romans after the 2nd Century.The people living here accepted Christianity in the 4th Century.These areas were acquired later by the Byzantines,the Seljuks,the Hamitoðullarý Principality and later by the Ottoman Empire.The city was developed in two sections:the citadel and the lower city Firt the city settled on the Acropolis on the high plains and later spread down to the lower plains as well.This area on the plains consists of a grid plan determined accoding to the Hippodamos plan. The two floors and the high stage of the antique theater which seats 15000 people are in excellent condition.The story of Dionisos’life is depicted on the frescos around the stage.The God of Wine,born premature,is placed in Zeus’body. You can also see the way he is taken by Hermes and given to the Nymphs and how he is seated on the sultanate (saltanat)chariot,carried by the panthers in the company of satyrs.There are30 rooms underneath the sitting area on the eastern wing of the stadium.The audience entered the arena through one of the doors opening from one of every three rooms and the other 20 rooms were used as shoops. The city had three gates.The Hellenistic gate,following the Roman gate in the entrance,also had an oval shaped courtyard.Passing through this gate one enters the three part,arch builth by Plancia Magna,a woman much mentioned in the inscriptions.Also definitely worth seeing are the Agora,the monumental fountain ,the Roman baths and the main street with a water canal down the center.